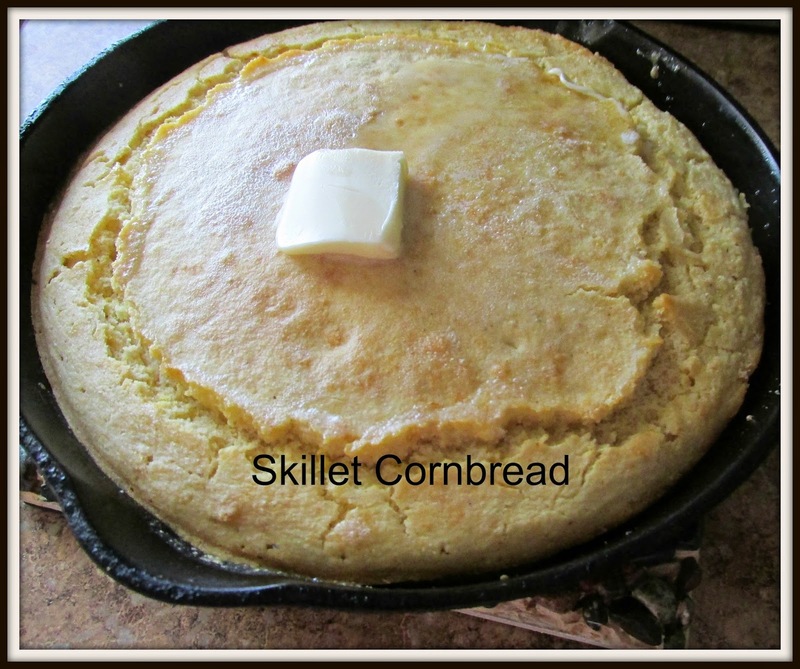 Skillet Cornbread accompanies so many meals at our house. Just for starters is a must have when the dinner includes soup beans, or fresh from the garden green beans or mustard greens, Really the list goes on and on. It sits on our table probably more than biscuits! Topped with a tsp of butter left to melt on top it's moist and delicious. Left to cool a little bit it's easier to cut and eat. We always have this little disagreement though at our house on whether to include sugar or not. If I don't, my husband loves it and if I do the rest of the family devours it! So I just kind of make it according to who is here. We've also made cornbread without the egg and hubby has loved it. Melt shortening in an iron skillet. Mix cornmeal, flour, egg and sugar if using. Then stir in milk and the rest of the melted shortening from skillet. Pour mixture in the iron skillet and cook at 450 for about 20 minutes or until done and nicely browned. Top with a tsp of butter after it gets out of oven and let melt on top. I always love to save my cornbread for the next day for dinner or even freeze it to make cornbread dressing later on.